Jemini Crafts: A Six Sided Card ! A Six Sided Card ! Well, that title is not quite accurate, it's actually a card made with a stamp set called 'Six Sided Sampler', and features lots of hexagonal designs! I have matched it with Honeycomb Hello and the Hexagonal punch to make a quick and easy card. 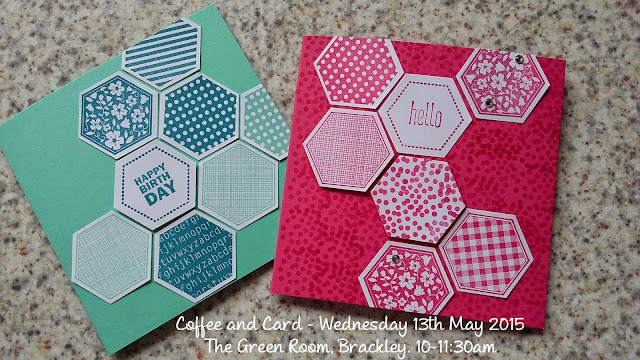 This is the design I am using at Coffee and Card tomorrow (Wednesday 13th May). Here is a list of the main products used above. Scroll down to view the items, and click on any photos for more details.